The Photo Ladies set out to cover recent Tiny Desk Concert Contest winners, Tank & The Bangas, on their tour in April and May of 2017. What’s been your favorite fan moment from this tour? Gifts! [Laughing] Hell yeah! Somebody brought me glasses last night. They got monkeys on them! They’re crazy! So yeah. The fans giving me a piece of them… to know most definitely that this is where it came from. I love it. 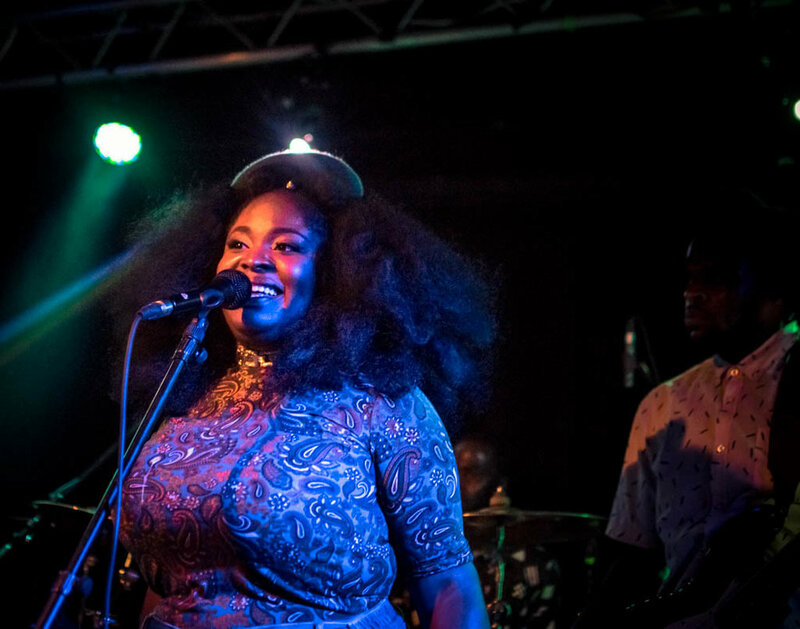 2017 has been a whirlwind year for New Orleans’ sweethearts, Tank & the Bangas. 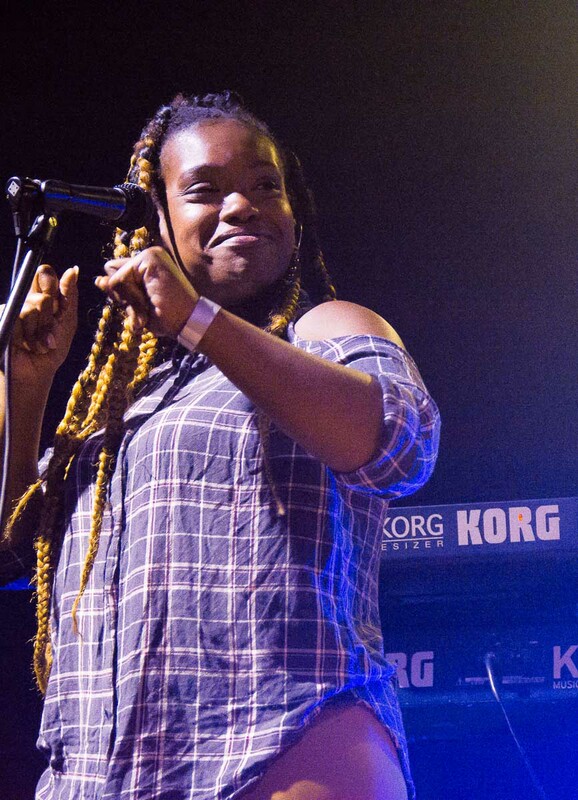 Having won NPR’s tiny desk contest, the band, led by Tarriona “Tank” Ball, have been selling out venues in every city they’ve traveled to. The Photo Ladies were able to catch a live show in various cities throughout the US. Judie Vegh got to sit down with Tank before their sold out show in Columbus, Ohio. Now that you’re getting used to your newfound fame from the Tiny Desk contest, How are you feeling about it? What’s it like to tour and get recognized and garner so much attention from it? Well we have always been doing it for so long - like 6 years or so. But there were always certain people in certain cities that were always so excited to see us. But now it’s bigger. We never experienced a sold out show before. It’s crazy. And to have people you have always loved tell you that they loved your music, too? That’s just a crazy feeling. But through it all, I still feel like myself. People say “Oh, they’re so new!” but we’ve been doing this for a minute. Your family is proud of you, then? Very proud! C’mon! They’re like “Tank’s famous!” “That’s my Tank! She’s famous!” You don’t want anyone in your family tripping over you, but just know that they’re proud of you. I don’t want them talking about it too much because when I’m home, I wanna chill. 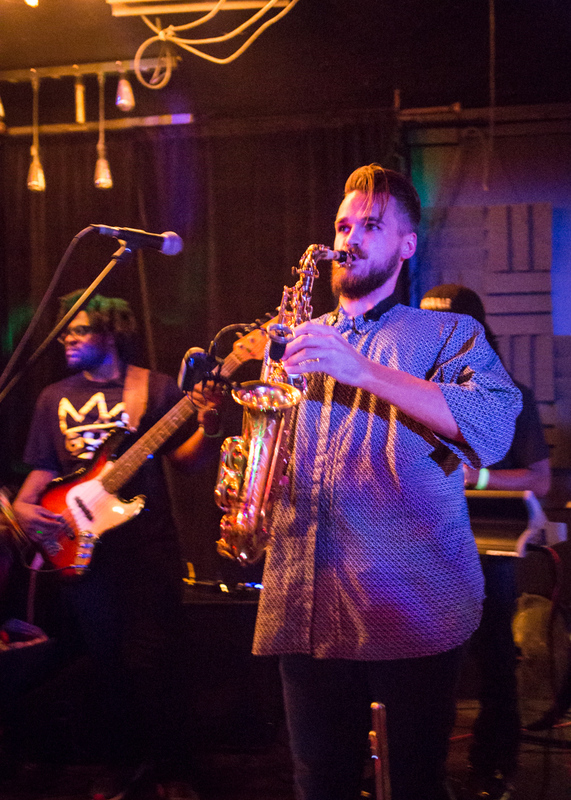 Tre Anastasio said, “Tank and the Bangas is like a psychedelic joy rap explosion. Like a female Sly Stone teleporting into 2017 and landing in New Orleans.” Do you agree? Daaaaaamn! I heard some of that, not all of it in full. That’s crazy someone would write something like that for you. That’s amazing. Prior to Tiny Desk, did you think you were trying to get famous? Did you want national attention? I was doing my own thing. Knowing that you can’t do anything else, and that nothing else makes you happy. So you might as well go forth on something that actually does make you happy. I never really wanted fame more than money. So I could show mom, “Look, Mom! I could live off this. I didn’t have to finish school. I went there for you, but I didn’t have to finish.” And i’m going to do something with this gift inside me. It never was for fame. It was just to live comfortably off something inside of you. You are a very talented poet and it speaks to people. When did you figure out you were a poet, and how did you think to incorporate it with music? When I was 12, at my grandparents’ 50th wedding anniversary party, my cousin gave me a poem to recite. And I practiced it every night, and I fucked it up. I fucked it up so bad. But I just kept going. My grandmother must have saw something in me, and took me to every church to recite the poem. I knew I was killing it! Then I made my first poetry book and it had my name, age, date of birth, what’s your favorite color… And I knew I was a poet because I had a book. I write everything down. If I’m feeling something, I just write it down. Something I never thought I do was write in my phone a lot. There’s always something inside yourself that you have to put it out. Writing is such therapy. Sometimes you can laugh at the place you were in a few years ago. Maybe you were feeling a little sad, and you’re still there. But it’s important to document how you were feeling. But would you agree with that? [Laughing] I will agree with anything positive he says! My gosh! I consider myself and everyone around me to be so very unique and special. [Etienne] was born in Turkey. Norman is from Baltimore. I found Jelly in college before she dropped out… even before I did. For someone to compare us at such a high level, it’s so very special. There are people out there who see something that you yourself can’t even see. You know by looking at a crowd, you can believe it because it’s magic. I didn’t expect all of this. Do you ever have to pump yourself up? Sometimes. But as soon as that music gets started, I’m in it. I’m there. It’s so cool to look at all the peoples’ faces! I’m nervous and cool at the same time. How does the creative process flow? Josh is the music director… how does that work with the band? I write something and take it to him, and everyone in the group. Josh can put it together like a puzzle. If I’m stuck on a word, he can help me figure it out. You are such a burst of energy on stage. I have no idea how I do that! [laughing] I must get the energy from the crowd. 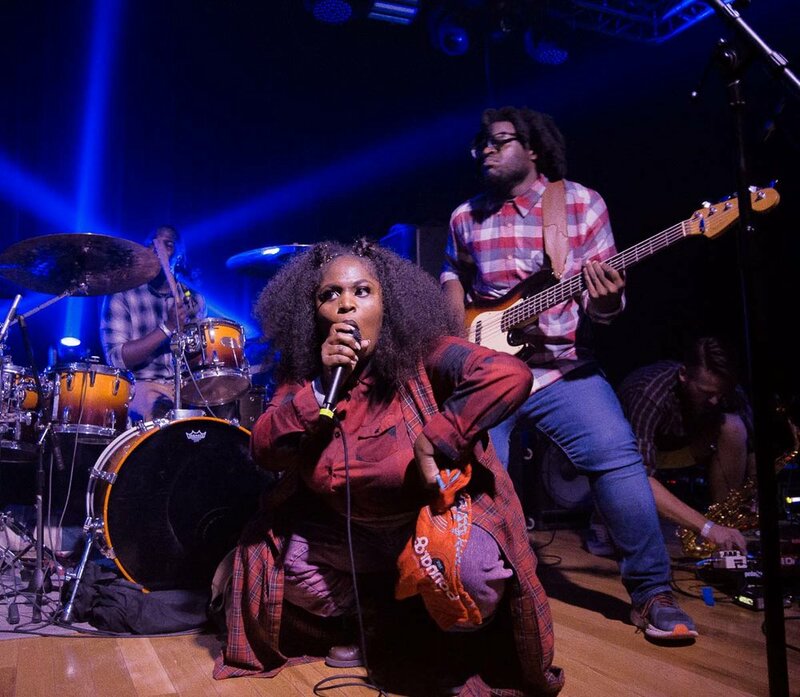 What’s next for Tank & the Bangas? Touring! Going to France, going overseas. I would love to collaborate with people who inspire me the most. People I consider to be famous who other people don’t know them. I love this guy Sunni Patterson who is a poet, Kendrick Lamar… the list goes on. Chance the Rapper had a jam session with me and told me how proud he was and how inspiring I am. I met Noname who is also a poet and rapper. I’m so excited for what the future will bring. It’s been a wild ride.